This chapter sheds light onto theoretical and empirical debates regarding the nature hyperlink as a political tool: whether the hyperlink is part of the “offline world” or should be considered as a new and separate form of practice, mainly due to its low cost and easy construction. 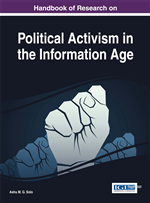 The chapter contributes to the present literature in two innovative ways: First, based on link analysis between 90 Websites of protest Israeli NGO, a classification of link strategies was made, and 4 different linking strategies were found: Isolation, Introversion, Neighborliness, and Generalization. Furthermore, this chapter analyzes 15 protest issues and is not focused only on a single issue network. Second, 29 in-depth interviews were conduct and enable a sketch of the “offline link analysis map” and a comparison of the online policies with the offline policies. In order to understand the choice of the organization linking strategy over the others, and the decision to which exactly other organizations/Websites link to, one must remember that the Web is only one arena where the political actors operate. Therefore, the in-depth interviews not only reveal the causes affecting the hyperlinks selection and strategy in each organization but also reveal similarities between the organizations with overlap linking strategy. The hyperlink is a technical means of linking words and ideas to each other causing the surfer to jump from one web page to another. In essence, the hyperlink is the navigation tool that can create any kind of link (positive or negative) with another entity- it encourages relationships (Dimitrova et al, 2003; Kovarick, 2002). In an article published in 2006 in the New York Times magazine, Kevin Kelly proposed we regard the ubiquitous web hyperlink as one of the significant inventions of the last 50 years. With the massive penetration of the internet into our lives and with its enhancements such as Web 2.0 and the development of the social web many political and economic players have grasped the tremendous power of the hyperlinks and now strive to consciously use them to advance their views, so that today it is hard to imagine surfing without them (Turow, 2008; Halavais, 2008). The internet embodies an inconceivable amount of information on every topic imaginable. The popular search engines, which were originally meant to solve the problem of filtering information according to relevance, gradually became immensely powerful ranking tools which determined one’s online visibility1. It is not only the information search process that is affected by the number of hyperlinks, but also the public online visibility, since the links can also affect the players’ degree of prominence and thereby influence the entire public and political discourse on any given issue. The hyperlinks play an important role in political, collective and communications activities since the linking network increases the interest in and importance of any issue on the web (Halavais, 2008; Park & Thelwall, 2003; Dimitrova et al, 2003; Rogers & Marrers, 2000). In light of this, there is clearly an urgent need to use hyperlinks as a political tool to attain web visibility among challengers, who constitute the object of this research. One way to perceive the internet as a political arena is using hyperlink analysis to map out cyberspace. The stronger the presence of the hyperlink in online platforms the more layers of social and political meaning it encompasses, In other words, there is definitely competition for political power that is considerably influenced by the offline reality (Turow, 2008; Halavais, 2008). Understanding the psychology behind the decision to create a link to a particular website or webpage may help us understand aggregate social behavior. One must seek to integrate the macro (social network) with the micro (a single link or the particular linking pattern of a single player), because the analysis of linking networks rather than of each website on its own significantly improves our understanding, and can even help us understand the micro level better, (Halavais, 2008; Bennet 2004) as to showed in this paper. Turow (2008) calls on researchers to monitor the considerations that guide a person/organization to link to one website rather than another, and to map out the channels of information flow and the power reflected by the digital links in order to gain an in-depth understanding of their social significance. In this article, I will move forward with the above suggestions and through an in-depth examination of the Israeli case, propose a typology that is the first of its kind for classification of linking strategies. The focus of this study is the issue network(s) that exist between 90 Israeli social change organizations. The findings presented here constitute part of a broader research that also includes 29 in-depth interviews I conducted with webmaster in order to understand the factors that affect the choice of one linking strategy over another.